A study by Casselli and colleagues finds Borrelia burgdorferi activates human astrocytes cells in culture. Astrocytes are cells found in abundance in the central nervous system (CNS) that have been described as “key responders to CNS infection and important components of the blood-brain barrier,” according to Casselli in the Journal PLoS One. 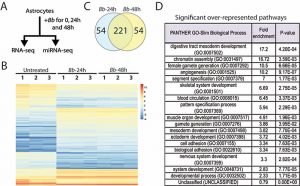 Credit: MicroRNA and mRNA Transcriptome Profiling in Primary Human Astrocytes Infected with Borrelia burgdorferi, PLoS One, Timothy Casselli et al. Casselli T, Qureshi H, Peterson E, Perley D, Blake E, Jokinen B, Abbas A, Nechaev S, Watt JA, Dhasarathy A et al: MicroRNA and mRNA Transcriptome Profiling in Primary Human Astrocytes Infected with Borrelia burgdorferi. PLoS One 2017, 12(1):e0170961. Jacek E, Fallon BA, Chandra A, Crow MK, Wormser GP, Alaedini A: Increased IFNalpha activity and differential antibody response in patients with a history of Lyme disease and persistent cognitive deficits. J Neuroimmunol 2012. Parthasarathy G, Fevrier HB, Philipp MT: Non-viable Borrelia burgdorferi induce inflammatory mediators and apoptosis in human oligodendrocytes. Neurosci Lett 2013, 556:200-203. No Replies to "Borrelia burgdorferi activates human astrocytes cells in culture"